Sycamore, Illinois USA — Installing and repairing commercial lighting fixtures requires knowledge of the most recent electrical codes, along with professional experience and quality accessories for the job. 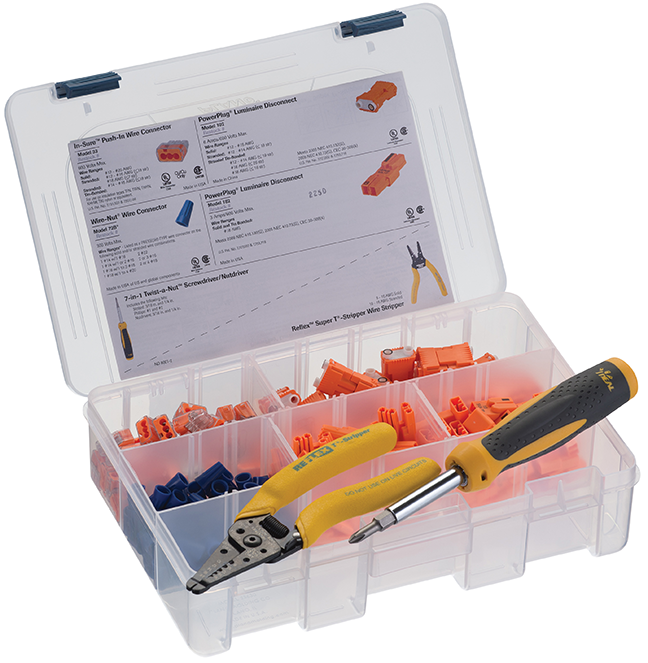 To help electricians meet the challenge, IDEAL Electrical has introduced two all-in-one wire connector kits featuring IDEAL supplies conveniently stored in a handy carrying case. Available immediately, IDEAL is offering a basic lighting maintenance kit (part #30-2255) and a complete lighting installation kit (part #30-2257). In addition to an IDEAL Twist-a-Nut™ Screwdriver and Reflex™ T-Stripper Wire Stripper, the Lighting Installation Kit includes 100 of the company’s classic Model 72B® Wire-Nut® Wire Connectors; 50 Model 33 In-Sure™ Push-In Wire Connectors featuring an ergonomic push-in design for easy grip and comfort; and 80 PowerPlug® 2-pole Luminaire Disconnects (30 standard, 50 retrofit) that fully meet the current National Electric Code and Canadian Electric Code for non-residential fluorescent luminaires. PowerPlug® Disconnects are perfect for new, retrofit or OEM lighting installations and allow for safe disconnect of hot and neutral ballast wiring. The basic maintenance kit comes with 50 Wire-Nut® Wire Connectors (25 Model 72B®, 25 Model 73B®), 25 In-sure Wire Connectors, 25 SpliceLine® In-Line Wire Connectors and an assortment of PowerPlug® Luminaire Disconnects in both 2-port and 3-port models.